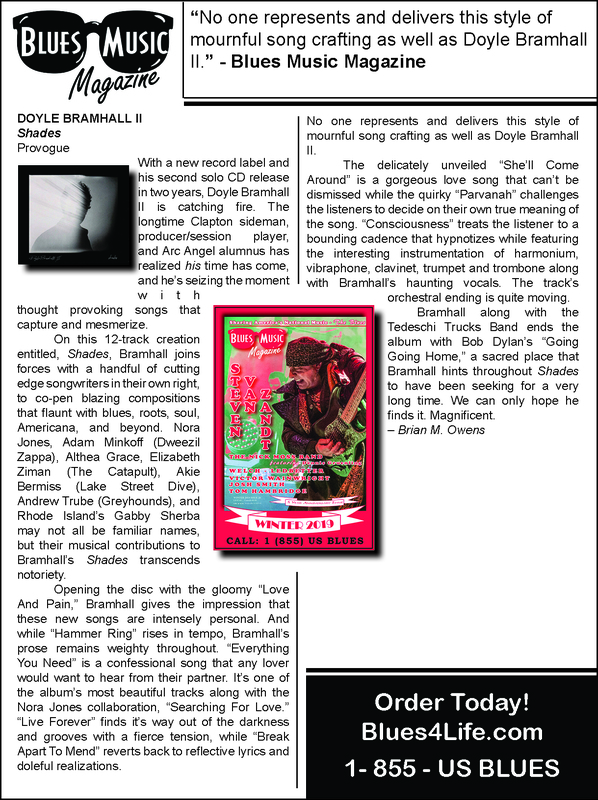 On Oct.5, 2018 Provogue Records will release Shades, singer-songwriter and guitarist Doyle Bramhall II’s debut for the label. Shades is a spellbinding blend of grungy blues, raucous garage rock, transcendent psychedelia, and soothing, soul-stirring ballads that sees Bramhall reaching new heights as a multi-instrumentalist (he plays guitars, bass, drums and keyboards), producer and vocalist while responding to his heart’s most urgent commands as an arranger and lyricist. What is it about Doyle Bramhall II, and why does everybody want to work with him? Shades features a host of friends and luminaries who have all, in one way or another, played significant roles in Bramhall’s musical story: Eric Clapton, Norah Jones, the Tedeshi Trucks band, and Austin buds the Greyhounds. Since 2000, the uniquely gifted guitarist, singer, songwriter and producer has been practically joined to Eric Clapton’s hip as both an onstage and studio collaborator. Clapton makes a notable appearance on the album, providing blistering back-and-forth guitar work with Bramhall on the quaking R&B-tinged “Everything You Need”. Bramhall and pianist-singer Norah Jones have been making music together for years, and the two form a heavenly alliance on the elegant ballad “Searching for Love.” Shades concludes with a reverent reading of Bob Dylan’s classic “Going, Going, Gone,” a gem from the singer's 1974 album, Planet Waves. Bramhall had recently performed the song with the Tedeschi Trucks Band at a Gregg Allman tribute concert last year, and he felt that a reunion with the group would make a powerful coda on his record.